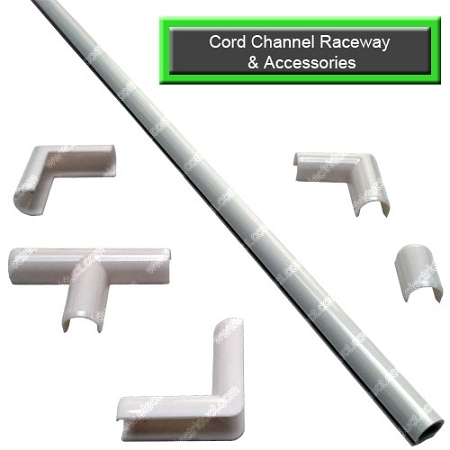 The Cord Channel Raceway is a one piece construction with an open slit and a 3/8" diameter opening for single cable applications such as a phone line. Pre-applied adhesive allow for quick installation and the optional accessories can help strategically route your loose cord. This site is great. 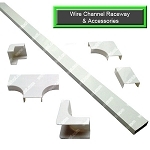 I am running some speaker wire for a 6.1 surround sound system and Lowes and Home Depot only sell the packs of the joint pieces. 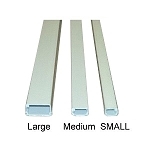 Even online from Lowes I was only offered limited types of joints. Nowhere offered a T joint which I needed for my setup. I was going to make my own using two 90 turn joints until I found your site. The pieces were shipped fast and fit perfectly. The price is better than anyone else had to offer also. I wish I would of known about you guys sooner! I ordered a single cord channel and received it in less than a week. Very good quality and just as described. I used the adhesive strip to attach the cord channel along the lower track of a sliding glass door, and it feels totally stable. I had looked around at a number of websites for a solution to my surround sound speaker cable problem, and this ended up being perfect for the job.